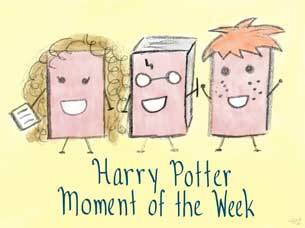 Rally the Readers: Harry Potter Moment of the Week (55): Quibbler or Daily Prophet? Harry Potter Moment of the Week (55): Quibbler or Daily Prophet? I'm going with The Quibbler on this one. It gave Harry a voice when the Ministry of Magic used the Prophet to drag Harry and Dumbledore's names through the mud. Plus, I think it'd be cool to try on a pair of Spectrespecs! I know that The Quibbler didn't always print the most factual articles, lol, but it believed in Harry, and that was definitely all right by me! Yess!! That's why I picked it as well. I thought about it for a while, and I'd much rather have somewhat silly articles in peace times as long as they give me the truth when it matters. Great pick! Here's my HP MOTW! My feelings exactly! I also thought that The Quibbler's less, ahem, serious pieces were entertaining, in their own way. I am going to put a pair of Spectrespecs in for my Blogoversary giveaway this year. We loved seeing everyone sporting those at Harry Potter World and I'd love a pair myself. I'm with you :D Quibbler for me as well! Jaclyn @ JC's Book Haven. I know what I'm buying when I finally get to Wizarding World of HP- Spectrespecs! I'm sure that's not the only souvenir I'm leaving with either, lol. Haha omg yes! I'd love a pair of those too. I think the reason for chosing DP was for Rowling's message about the press - don't believe everything you read basically! So true! And she delivered that message brilliantly! I love gossip so Quibbler it is! Hehe, I love gossip, too, and I'd read The Quibbler solely for that!